1. Employee/Employers already contribute about half of their own pension returns a year - that is, about 3%/year. So, the need to earn 6 (or 7)% a year is not really true, if one was to redirect tht money directly to retiree pensions, also saving 100s of millions in fees to managers who apparently cannot beat the S&P 500, and who fall WAY short on a risk-adjusted basis, and who seem poised to over-buy stocks just at the peak of a record long bull market...again. 2. 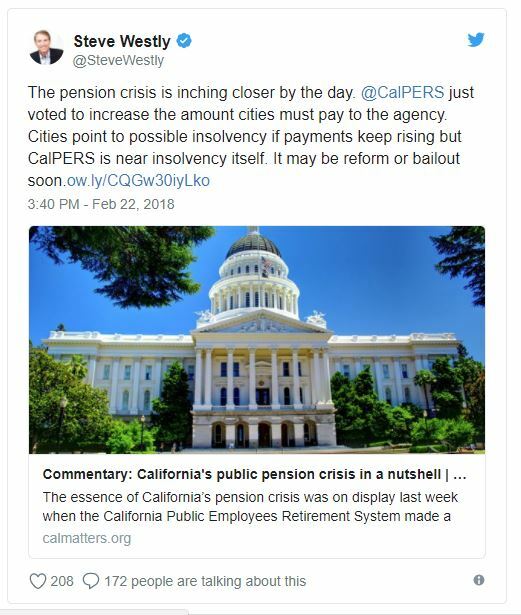 State Governments could return to doing what they used to do before Wall Street convinced them that the path to pension riches lay in using the market to pay pensions. Using market returns is a particularly poor way to pay pensioners, when governments can simply tax to pay that...and by refinancing bond obligations with part of the rest of CalPERS, improve their credit rating so they can borrow more cheaply in the future and save the millions they would have to tax for, making this a win-win wash. Remember, 94-95% of pension funds are NEVER paid out, but simply are retained to - supposedly - generate an ROI to pay pensions. This is not very efficient even for individuals, but it is just wrong-headed policy for governments with taxing authority.